^Terragen image by my son...thanks, Santino! 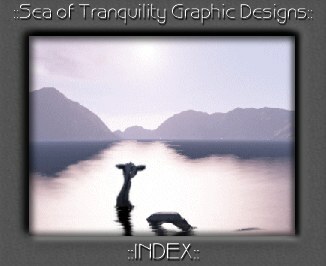 ^Would you consider voting for Sea of Tranquility as a WebbieWorld People's Pick? This webmistress supports freedom of expression for artistic purposes unless a person or group is targeted or portrayed in a manner patently offensive or hateful. Sea of Tranquility, however, is completely child-safe, and contains no material which viewers should find unsuitable for all ages. If you disagree, kindly email me with details of what you found objectionable and why. I am open to all input. Digimarc's patented technology used to watermark these graphics. Content & graphics within this site are copyrighted by N.L.Timpanelli 1999. Any concerns about this site should be addressed to N.L.Timpanelli ( galadriel@poboxes.com ). Who the heck made this stuff?? Click >here< to see me.